It looks DIY, with a 3.5mm stereo socket (presumably for the BC2), and a lead with a mono 1/4" jack. They're spliced together with a resistor across the join, one lead from a 9V battery connected to one side of the join, and the other lead from the battery apparently going to the third pin of the input socket. Any thoughts on what this arrangement might be used for...? ...the Tip (red wire) of the stereo plug is ground, the Sleeve (black wire) is +Volts and the Ring (white wire) is the output voltage. What is "+Volts" here...? Is this what the 9V battery is supplying...? 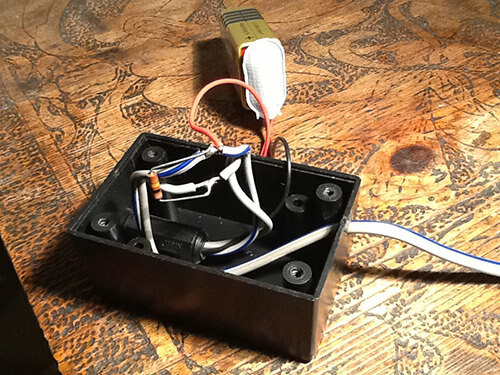 The breath controller is an active device and needs power, hence the 9V battery, and it appears to need volts on one terminal of the 3.5mm plug, reference ground on another, and the output control signal on the third. I'd be surprised if the sleeve really is +V and the tip ground... Worth checking with a meter. It's possible the supply volts needs to be negative rather than positive (relative to ground). I'm guessing it was designed to be powered from some other bit of Yamaha gear, but the previous owner of this unit used it with something else that didn't provide power. 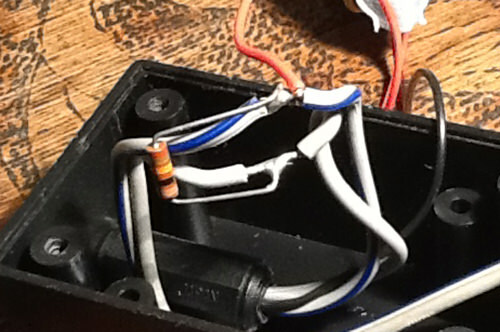 Yep, the Yamaha BC2 contains a hall effect sensor that requires a supply voltage to operate. 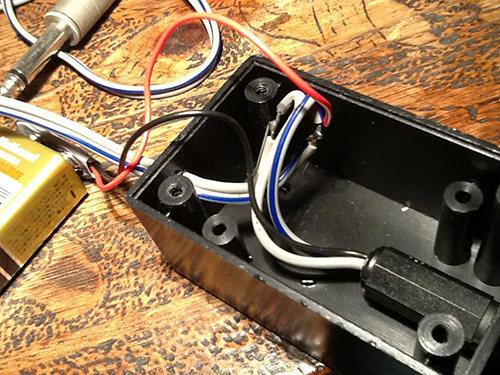 So, yes, the Tip (white wire) of the stereo plug is ground, the Sleeve (black wire) needs to be connected to that PP3 battery for +9V, and the Ring (red wire) is where you access the BC2 output voltage. Well done Martin. All becomes clear! I would suggest the reason for the earthing change is that the sensor itself has a connection that is also an interference shield, and they used a slightly different sensor in the newer model. It's quite an interesting circuit actually. IC2a creates a 'virtual' rail at half the supply voltage so all the other ones think they are getting + & - supplies. IC2b is unused but wired so it can't 'flop about' and create interference. IC1a takes the differential output from the sensor, amplifies it and makes it single ended. IC1b provides more gain (depending on those unstated resistor values) and DC balancing and control isolation. As for the resistor, it's needed as it provides bias so that the output diode is always conducting. However it looks like a carbon one so I would be inclined to change it for a modern metal film one. You can see that the original receiving device has something like that built-in. If you are running into and Arduino instead, I would suggest you find out what the actual voltage range of the breath controller is, then make an appropriate potential divider so you don't overdrive the Arduino's input. In any case, I always feed the analog inputs via a 10k resistor and shunt 47n cap. That provides filtering as well as current limiting in case of overloads. 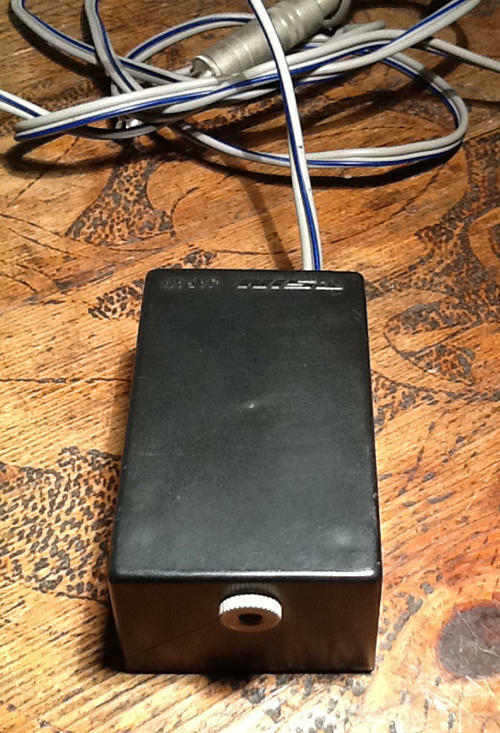 BJG145 wrote: I'm interested in putting together an Arduino-based MIDI converter for it. I wish I could read circuit diagrams like you Folderol. It's useful to have some electronics wizards around when people are trying to blow things up. I know but it has happened to me that I DSM (Did Something Myself) because I did't know it already existed, and If I had known before I wouldn't even have thought of doing it myself.